The low pressure area is now over Northern California and is moving eastward. Today will be partly cloudy to cloudy with a few showers, mainly over the foothills and mountains. Snow levels will be 1500 feet north and 2500 feet south. Sunday looks party sunny to partly cloudy with below normal temperatures and light winds. Monday clouds increase and there could be isolated showers over the mountains. Tuesday the rain starts up again as a low pressure trough develops along the coast. 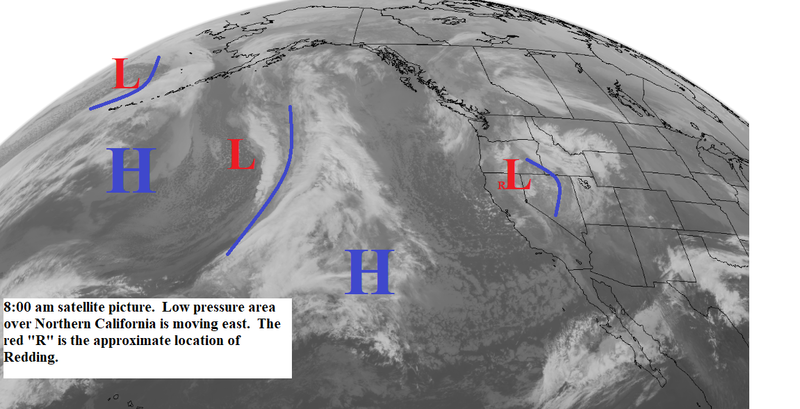 This trough will remain along the coast through early Friday (see map below). Look for rain from Tuesday afternoon through Thursday with showers Friday and early Saturday. Snow levels will start out at 4000 to 5000 feet and then rise to near 6000 feet Wednesday. Snow levels will drop to 2500 to 3000 feet north and slightly higher south Thursday and continue near that level through early Saturday. The showers end by midday Saturday and Sunday should be partly to mostly sunny.